A second cruise just months after our first cruise in fifteen years was my wife’s idea, not mine. She thinks that vacations should be about relaxation and pampering, not about hassling with hotels, rental cars and airlines. I am naturally more active than she is, but I concur that cruises have some major virtues. For me, their chief virtue is that while you visit lots of places, you unpack just once. This cruise is on Royal Caribbean, which as best I can ascertain is the fanciest cruise line, at least among the major players. They certainly have great looking and modern ships, unlike Carnival’s, whose fleet is looking seriously dated. Fortunately for their competitors, I am not someone who puts a premium on fanciness. I do expect staterooms to be comfortable, clean and reasonably quiet, the destinations interesting, and the price not exorbitant. I don’t need chocolates on my bed pillow or (an increasingly alarming trend among cruise companies) animals created from folded towels posted at the foot of my bed. If I had to pick two characteristics of cruise companies that I measure them by, it would be their food and the evening entertainment. The entertainment on Norwegian was excellent every night, and since my wife and I see plenty of shows, so we know quality from crap. Norwegian even brought in a troupe from Second City for one night of entertainment. I had not laughed so hard in years. Comedians are popular entertainers on cruise ships, I expect because they are relatively cheap compared to staging these Broadway-lite shows. Still, Norwegian has their own cast of singers, dancers and acrobats that truly dazzled. Our last show before berthing in Boston last August had a Bollywood theme with acrobats on bungee cords jumping from the rafters in time to the live music. It’s pretty hard to top that. As for the food, if they were still around then I’d be glad to cruise again on a dumpy old Dolphin Cruise Lines ship again as we did in 1995. We did find gourmet food last night on the Voyager of the Seas, but it was at Portofino, their specialty Italian restaurant that naturally cost extra. On dumpy Dolphin, there was just one main dining room but all the passengers ate gourmet food. You left the dining room hoping your licking the plate wasn’t too obvious. 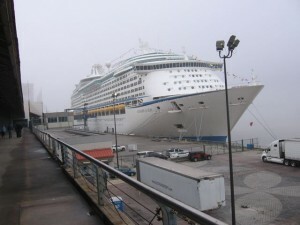 Otherwise our cruise on Royal Caribbean seems about the same as our cruise on Norwegian. Both ships are immaculately clean and over the top opulent. Royal Caribbean’s Voyager of the Seas wins marginally over the Norwegian Dawn, simply because the ship is bigger and no expense was spared. This is because at the time of its christening in 1999, it was the largest cruise ship in the world. For a guy who tends to shop at Kohl’s instead of Niemen Marcus, opulence simply does not matter. I won’t be purchasing fine diamonds or fancy artwork at their promenade in either event. Yet, in many ways Royal Caribbean is more pedestrian. Their “specialty” restaurants include a Ben & Jerry’s and a Johnny Rockets. Whereas Norwegian had at least half a dozen upscale specialty restaurants, the Voyager of the Seas offers only Portofino. Royal Caribbean is at least less in your face with announcements. Norwegian made sure we were aware of every single event via frequent and loud announcements. I grew to loathe my cruise directors, particularly the assistant cruise director for her endlessly annoying and obviously insincere whines promoting bingo. On Royal Caribbean they are more discreet, and generally limit themselves to a morning and noon announcement. Given their four-page list of activities we receive every day, we should have a good idea of what’s going on. One thing I am discovering: no matter how nice things are for us passengers, the bulk of the cruise staff has it rough. Perhaps there is something exotic about working for a company like Royal Caribbean, but after asking questions of our waiter I have to wonder what sane person would sign up to work on a cruise line. Most Americans would whine about working on Saturdays. At least for the waiters in the Royal Caribbean dining room, there is never a day off until the cruise season is over or their contract expires. Our waiter told us he works ten-hour days seven days a week. I guess when you are in international waters, you don’t have to worry about any stinking union contracts. Moreover, the vast majority of these jobs are mind-numbingly dull and tedious. I watched one guy today in the café doing nothing but filling up glasses with ice and pouring water and lemonade into them. There are whole crews in the café that do nothing but constantly take your dirty dishes to the dishwasher or smile and squirt your hand with sanitizers as you enter the restaurant. Just the thought of doing this for seventy hours a week sounds like enduring one of the lower levels in Dante’s Hell. Hopefully they at least get to rotate through positions to relieve the tedium. Most are away from family, but today’s newsletter “fun fact” tells us the ship has 134 married couples among the crew. I hope they work the same shifts. Once the land recedes, your world shrinks to your cruise ship. You may become myopic like me and notice things you should not. Royal Caribbean seems anally obsessed with cleanliness in a Joan Crawford sort of way. I imagine that a major outbreak on a cruise ship can have a huge effect on a company’s reputation and its bottom line, so it perhaps justifies the omnipresent Purex hand sanitizer machines and crew endlessly applying germ killers to handrails and surfaces. But is it really necessary to refrain from shaking the hands of our fellow passengers, as they recommend? Are we really supposed to give them fist bumps instead? Even Martha Stewart would have to find this behavior extreme. However, kudos to Royal Caribbean for making smokers’ lives inconvenient. Norwegian lets guests smoke in their staterooms. Here guests are allowed to smoke on their balconies, if they have one, and on the port side of the cruise deck. Also, kudos to Royal Caribbean for creating child-free zones. Up on the cruise deck there are adults only swimming areas, hot tubs and lounge chairs that are far away from the shrieks of children. Been there and done the child-rearing thing and once was enough. Everyone on the staff including the captain would have a smiley-faced yellow button on their breast and wear the ubiquitous blue Wal-Mart uniforms. But most of the crew would actually be subcontractors hired from third world countries so Wal-Mart would not have to pay any health insurance or retirement benefits. One deck would be a Wal-Mart superstore, with the added bonus that purchases would be duty-free. That’s keeping those prices low! Main dining would consist of a food court that would probably contain the greasiest of greasy franchises that you see at Wal-Marts, and no it would not be included in your cruise price. Yes, there would be a 24-hour Pizza Hut in the food court, along with a McDonalds, but definitely no Starbucks. Too upscale. Wal-Mart would market their own brand of coffee instead and the coffee shop would probably include boxes of Krispy Kremes you can purchase. The coffee would probably be a Sam’s Club brand. Need a salad? Wait until you arrive at a port of call and keep your fingers crossed. Instead, it you would get to choose from grease and sugar, with every entrée guaranteed to be at least 500 calories and contribute toward heart disease. Pretty much every object in your state room could also be bought at a Sam’s Club or Wal-Mart, including the furniture. To keep prices low, you would use the same sheets and towels for the duration of the cruise. You could save five percent if you cleaned your own stateroom. There would be scouring powder under the sink and $19.99 vacuum cleaner in the closet, but your cabin would have to pass inspection before you vacated to avoid a cleaning fee. When you sat on the potty in your cabin, you would stare into a TV screen with compulsory announcements promoting ship specials. Instead of a U.S. Coast Guard drill at the start of the voyage, you would be forced to sit in an auditorium and listen to Wal-Mart affiliated time-share pitches. The premium beer in the food court would be Bud Light. There would be deals for special airline fares based on an affiliation with Southwest. A sampling of evening entertainment: wrestling, an abridged play based on the life of Sam Walton and a contest for the most convincing imitation of a Fox News anchor. You would have an RFID chip embedded in your earlobe for the duration of the cruise, so you could always be found. You would see advertisements customized for you on electronic billboards as you walked around the promenade. Only penny slot machines would be allowed in the casino. I had better stop before I give Wal-Mart too many ideas.